Destry Abbott is a dominant desert racer who has raced in the desert his entire career. He was born July 13, 1972 and rides for Kawasaki. I dug up a few videos to share! It's all about riding right on the edge sometimes, which gets closer with fatigue. Sometimes you get a sharp reminder that you just crossed the line and went over the edge..hopefully you minimize the effects and pick yourself up to ride again. Check these out, they are so worth a look! Some of them are a little older, all but one is on a 2-smoke! Click the links, they can be viewed with windows media player. Ty Davis & Destry Crash Racing To The Flag! Sweet Jump Sequence With Roost! He looks great in racing. I also have a kasawasaki but it is not an Enduro style. Cool! Bike sounds like a raped ape! He is cool. I like the way he jumps the motor. Destry Abbott has spent the last few years establishing himself as one of the most consistent, if not the most dominant desert racers in the West. 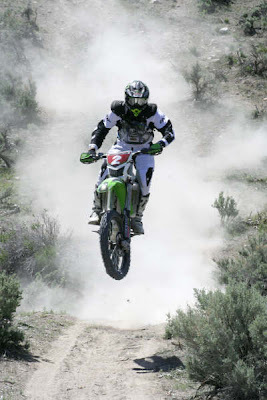 Destry Abbott has spent the last few years establishing himself as a single with the most steady, if not the best dominant desert racers inside the West. Destry Abbott takes another run on the escargot, this time a lot smoother and about a second faster. Destry Abbott is my favorite motorcycle racer. I raced with Destry at the 16th Annual Sonora To Rocky Point event back in 1992! 20 YEARS AGO! He smoked everybody that day. It's great to see him still racing so successfully. My career was cut short in a neck breaking, paralyzing crash 18 years ago. Ride on Destry!